Some 1,500 ballot boxes from May's disputed election in Malawi have been destroyed in an unexplained fire. It comes amid an opposition demand for a recount of voting papers for a parliamentary seat in a constituency in the capital, Lilongwe. The High Court was set to hear arguments about the case on Thursday. In May, it overruled an attempt by former President Joyce Banda to annul the presidential vote, which she said was marred by rigging. Peter Mutharika, leader of the Democratic Progressive Party (DPP), was declared the winner, taking 36.4% of the presidential vote. International election observers declared the polls to be generally free and fair. The BBC's Raphael Tenthani in Blantyre says this surprised many Malawians who felt there had been a number of irregularities. The Malawi Electoral Commission (MEC) itself had admitted as much and asked for a 30-day extension to declare the results so that a recount could be carried out. But following a DPP petition, the High Court refused to allow a delay. The fire broke out overnight at a warehouse in Lilongwe where ballot boxes were being kept. The ballots are at the centre of disputed race in which the DPP's Bently Namasasu narrowly beat Ulemu Msungama of the Malawi Congress Party (MCP) by 98 votes. Our correspondent says that if the recount for this constituency had overturned the official result, it would have cast doubt on the whole election. MCP leader Lazarus Chakwera, who came second in the presidential poll with 27.8% of the vote, was also seeking a recount through the courts. 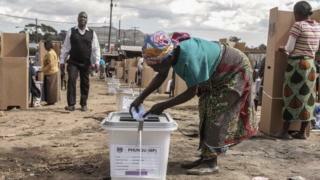 This will now not be possible as Malawi does not have an electronic back-up for ballots. Mrs Banda, who came to power after the death of Bingu wa Mutharika two years ago, came third in the poll with 20.2% of the vote.